Food prices refer to the average price of particular food commodities globally and across countries. The price of goods not only provide an important indicator of the balance between agricultural production and market demand, but also have strong impacts on food affordability and income. Food prices not only influence consumer affordability, but also influence the income of farmers and producers. In low-to-middle income countries in particular, a large share of the population is employed in agriculture. Producers typically benefit from higher food prices; consumers from lower prices. Food markets can therefore have a strong impact on food affordability, hunger and undernourishment and dietary quality. This entry presents the empirical overview on global and country-level food prices and expenditure, spanning the long-term to very recent changes. 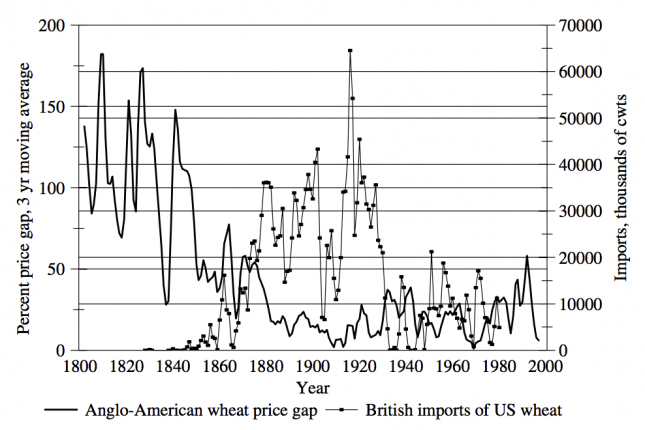 The visualisation shows the price of wheat in England over more than 7 centuries. 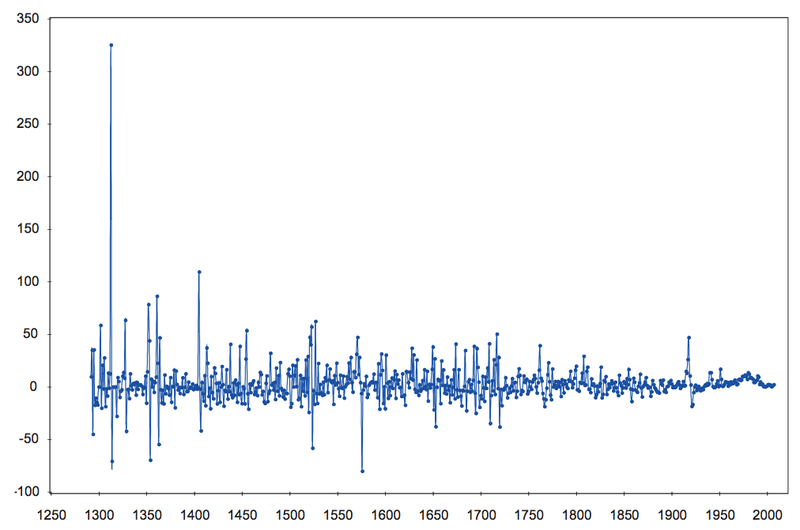 The following visualisation shows long-term commodity price indexes across various food items since 1850, relative to real prices in the year 1900 (i.e. prices in 1900 = 100). The volatility of food prices matters especially for the wellbeing of poorer people since the price increases can translate into shortages of food supply at low income levels. The following visualisations show the declining volatility over the very long-run in various locations. Especially important for this decline was the increasing integration into larger markets so that poor harvests in one area can be compensated by importing food from regions less affected by worse harvests. In the map below we see the average per capita food expenditure across select countries, as published by the United States Department for Agriculture (USDA). Food expenditures are measured in US$. Overall we see large differences in food expenditure across the world. The average Swiss expenditure was $3,631 in 2016 - more than 10 times higher than the average Venezuelan who spent only $258. In the chart below we see the share of total consumer expenditure spent on food across select countries in 2015. For some countries, food constitutes a large share of expenditure - Nigerians spent 59 percent of total expenditure on food. For others, food constitutes a small share - in the United States, this share was only 6 percent. This relationship is explained by a concept called &apos;Engel&apos;s Law&apos; which we explore in the Correlates section of this entry. In the chart below we see the long-term global commodity price index of cereal crops (wheat and corn) alongside the oil price index since 1850. Although not perfectly matched, we see some relationship between the two: increases in oil (energy) prices tend to result in increases in cereal prices. The second potential reasoning for this relationship relates to the allocation of crops to biofuels - an important consideration in terms of food security. The rationale follows that a rise in oil prices drive demand in the production of biofuels; this increased diversion of food crops to biofuel production reduces food supplies, resulting in an increase in price. The role of biofuel production on food prices and food security remains strongly contested. Following the rise in food prices over the period 2005-2008, several authors - including the World Bank - attributed the largest driver to be increased biofuel production in the United States and European Union.12 The authors state that the rise in food prices " the most important factor [in higher food prices] was the large increase in biofuels production in the U.S. and the EU. Without these increases, global wheat and maize stocks would not have declined appreciably, oilseed prices would not have tripled, and price increases due to other factors, such as droughts, would have been more moderate." Other studies which assess the relative contributions of different drivers of food prices suggest the price relationship between biofuel and food commodities is more complex. Zilberman et al. (2012) conclude that the introduction of biofuels can affect food prices but this impact various significantly by crop type and location; this effect is less marked when biofuel production is not competing for natural resources with food crops.13 For example, the use of sugarcane ethanol in Brazil or use of non-food crop biofuels (such as miscanthus grasses) are likely to have a smaller impact on food prices relative to cereals such as wheat or corn. The authors also note that the impact of biofuels on food prices can be significant, but less so than other drivers such as economic growth, or the introduction of genetically-modified crops (which have the opposite effect on prices). 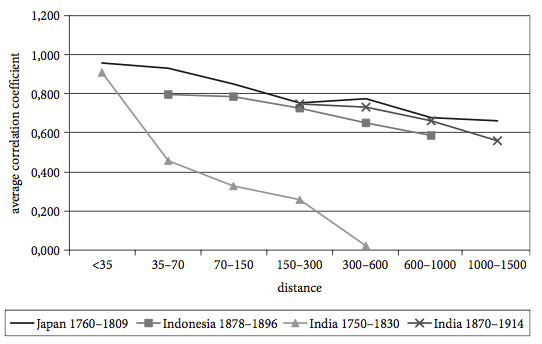 In the following graph you see two important aspects: Firstly the correlation between price correlation and distance and, secondly, how in India between 1750-1830 and 1870-1914 the agricultural market became more integreated, and the price differences between different regions were reduced. In 1857, the economist Ernest Engel wrote: "the poorer a family, the greater the proportion of its total expenditure that must be devoted to the provision of food", with later extension of this concept to national and global levels.20 This later became known as &apos;Engel&apos;s Law&apos;. &apos;Engel&apos;s Law&apos; states that as incomes rise, the proportion of consumer expenditure spent on food falls, even if food expenditure rises in absolute terms. We can see this relationship in the following two charts across select countries of varying income levels. In the first chart we see the relationship between the share of consumer expenditure spent on food (y-axis) versus gross domestic product (GDP) per capita. Overall we see that countries at lower incomes tend to spend a much higher percentage of expenditure on food; countries with per capita GDP below $5,000 tend to spend more than 30 percent of expenditure on food. Countries at the high end of the income scale tend to spend a much lower share: typically 10-15 percent. Those at higher incomes tend to spend a lower share of expenditure on food - this is despite the fact that they tend to spend more on food in absolute terms. In the chart below we see total food expenditure (in US$ in 2015) on the y-axis versus GDP per capita. Here we see that as incomes rise we spend more money on food in absolute terms; the average person in Switzerland spends more than 10 times as much on food than the average Indian. However, this is despite the fact that the average Indian spends more than three times as much as a share of total expenditure, as seen in the chart above (the average Indian spends 31 percent of total expenditure on food, versus only 9 percent in Switzerland). So, as incomes rise we tend to allocate a smaller share of total expenditure on food (and spend it instead on other goods and services) despite spending more on food in absolute terms (as seen in the chart below). 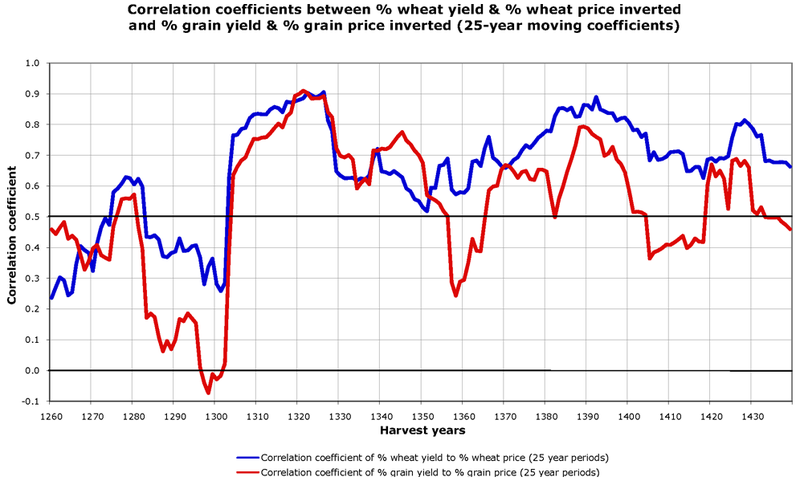 Data: David Jacks an expert in agricultural history publishes many food price series on his website. Time span: Some of the series go back to the Middle Ages but most start after 1800. Available at: David Jacks personal website here. Available at: The website of the International Institute of Social History here. Data: Food prices of over 200 commodities for primary crops, live animals and livestock – “representing over 97 percent of the world’s value of gross agricultural production” (FAO). Producer prices and producer and consumer price indices. Geographical coverage: Over 130 countries. Time span: The up-to-now series go back to 1991, whilst the Price Archive contains historical data from 1966 to 1990 (these series are not always comparable). 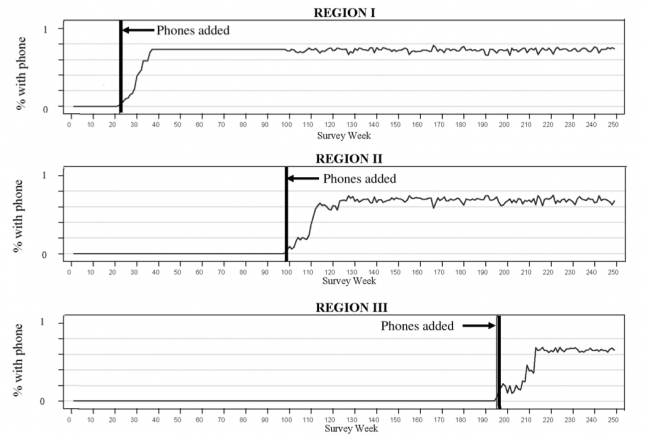 Monthly and annual data. Available at: The FAO Food and Agricultural Price Statistics are online here. Available at: the FAO food price level index page. Available at: the FAO here. Data: FEWS publishes country-by-country Price Bulletins that provide graphs tracking the prices of commodities that are important locally. Geographical coverage: on a small scale level within countries. Time span: mostly the recent past. FEWS was created in 1985 by the US Agency for International Development (USAID). Data: Data on coffee prices, coffee trade, coffee consumption and more is available from the International Coffee Organization (ICO). Time span: From 1990 onwards. This data is taken from the report '100 Years of U.S. Consumer Spending: Data for the Nation, New York City, and Boston' published by the Bureau of Labor Statistics (BLS Report 991). Online here. More specifically it is taken from the chapter on 2002-3 online here. I have taken the idea for this graph from The Atlantic online here. The source is FAO, IFAD & WFP (2013) – The State of Food Insecurity in the World 2013 - The multiple dimensions of food security, Food and Agriculture Organization of the United Nations (FAO), the International Fund for Agricultural Development (IFAD) or of the World Food Programme (WFP), FAO, Rome, 2013. Online here. The FAO is the source and copyright holder of this material. 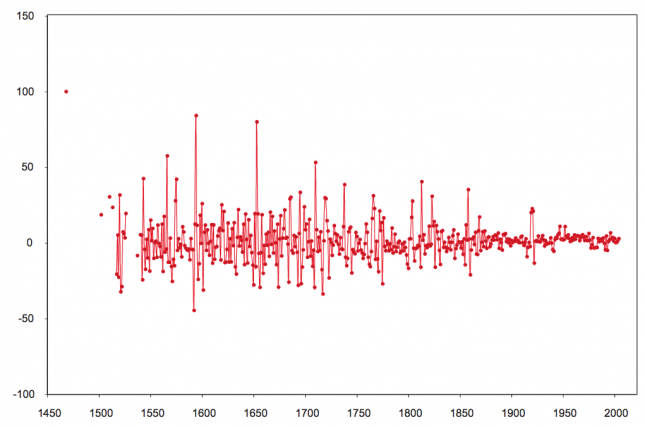 This is taken from Söderberg (2010) – Long-term trends in real wages of labourers. In Rodney Edvinsson, Tor Jacobson och Daniel Waldenström (eds.) 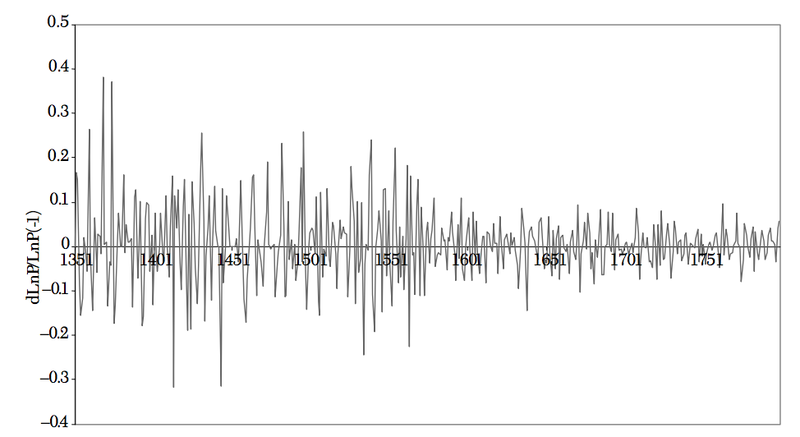 (2010) – Historical Monetary and Financial Statistics for Sweden: Exchange Rates, Prices, and Wages, 1277-2008. The entire book is available online here. 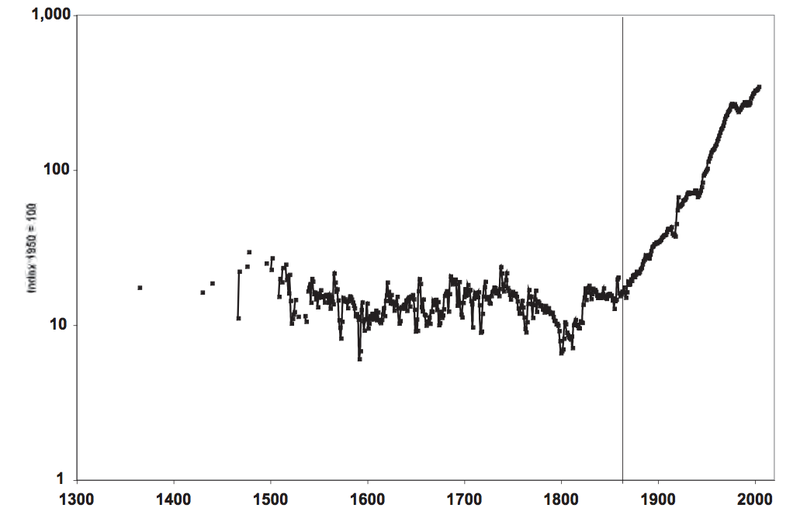 Note by the authors: A vertical line marks the change in 1865 from unskilled labourers in Stockholm to industrial workers in Sweden. This is taken from Ó Gráda (2007) – Making Famine History. 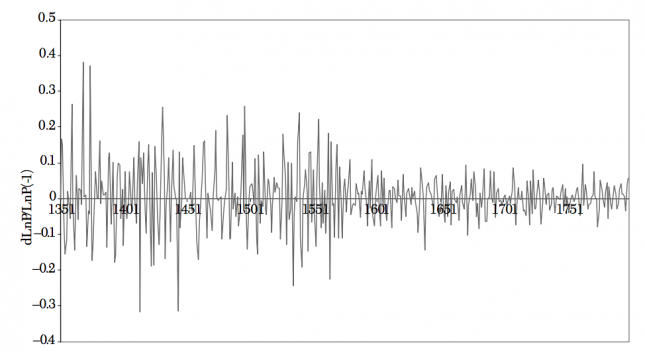 Journal of Economic Literature. Vol. 45, No. 1 (Mar., 2007), pp. 5-38. 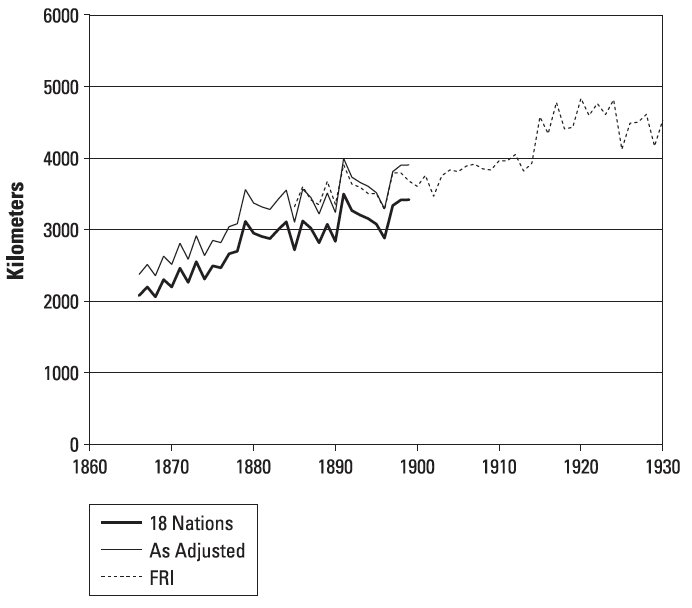 This is taken David S. Jacks (2000) – Market Integration in the North and Baltic Seas, 1500-1800. Department of Economic History. London School of Economics. 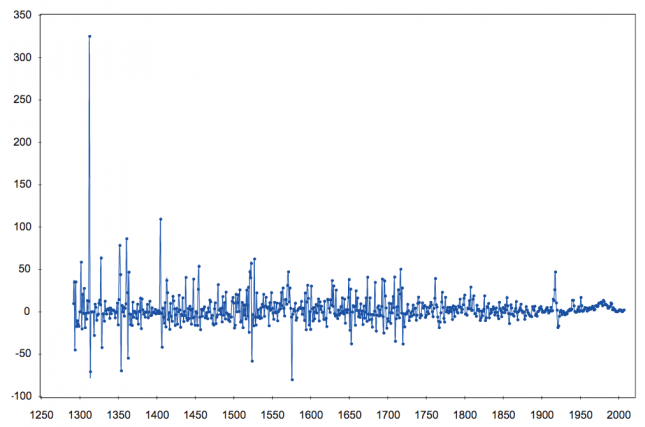 The coefficient of variation is defined as the ratio of the standard deviation to the mean. The author, who is a professor at Queen's University Belfast (academic website), is the copyright holder. Gilbert, C. L. (2010). How to understand high food prices. 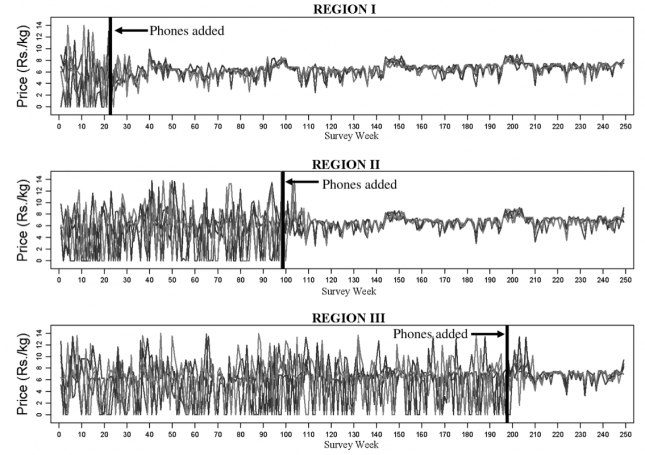 Journal of Agricultural Economics, 61(2), 398-425. Available online. Mitchell, Donald. 2008. A note on rising food prices. Policy Research working paper ; no. WPS 4682. Washington, DC: World Bank. Available online. Zilberman, D., Hochman, G., Rajagopal, D., Sexton, S., & Timilsina, G. (2012). The impact of biofuels on commodity food prices: Assessment of findings. 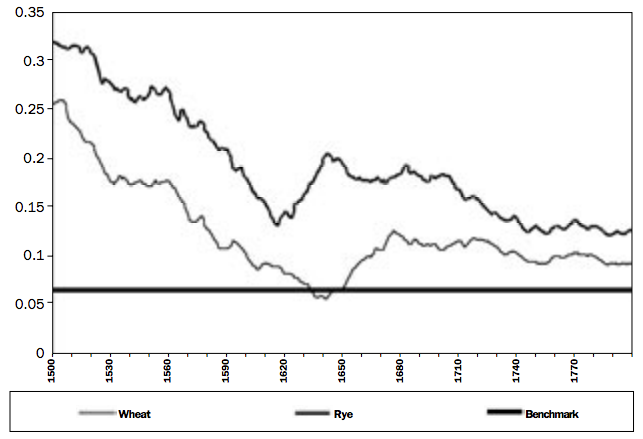 American Journal of Agricultural Economics, 95(2), 275-281. Available online. This is taken from Alan L. Olmstead and Paul W. Rhode - 'Biological Globalization' in Hatton, O'Rourke, and Taylor (ed.) (2007) - New Comparative Economic History: Essays in Honor of Jeffrey G. Williamson. MIT Press. 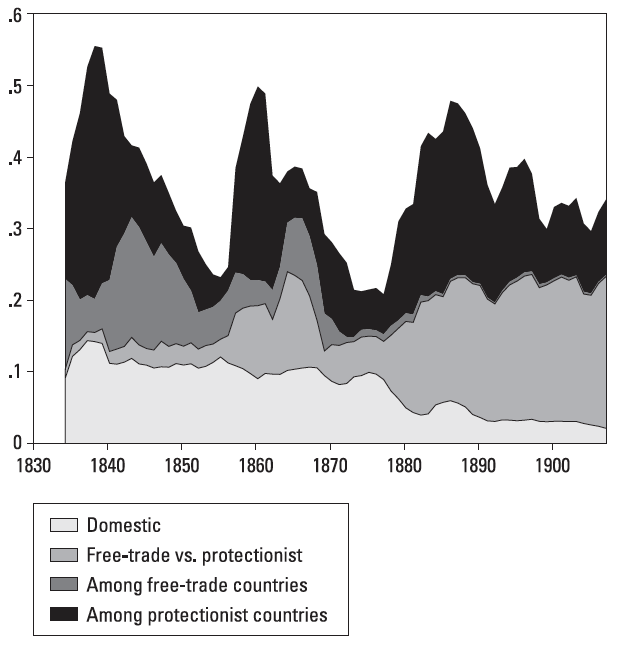 This is taken from O'Rourke & Williamson (2005) – From Malthus to Ohlin: Trade, Industrialisation and Distribution Since 1500. Journal of Economic Growth. March 2005, Volume 10, Issue 1, pp 5-34. Online here at the Journal of Economic Growth and here at the University of Oxford. This is taken from Van Zanden (2009) – The Long Road to the Industrial Revolution. Brill Academic Publishers. The book's website at the publisher is here. 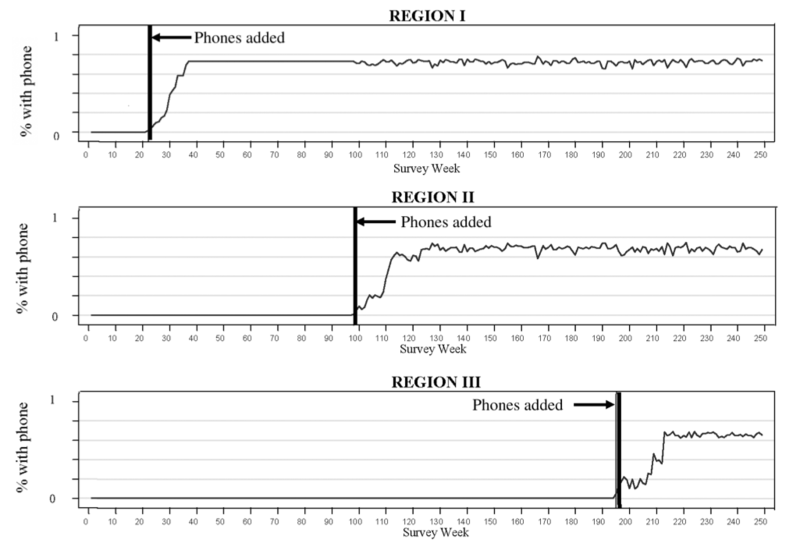 This is taken from Jensen (2007) – The Digital Provide: Information (Technology), Market Performance, and Welfare in the South Indian Fisheries Sector. In The Quarterly Journal of Economics, 122, 3, 879--924. Online here. 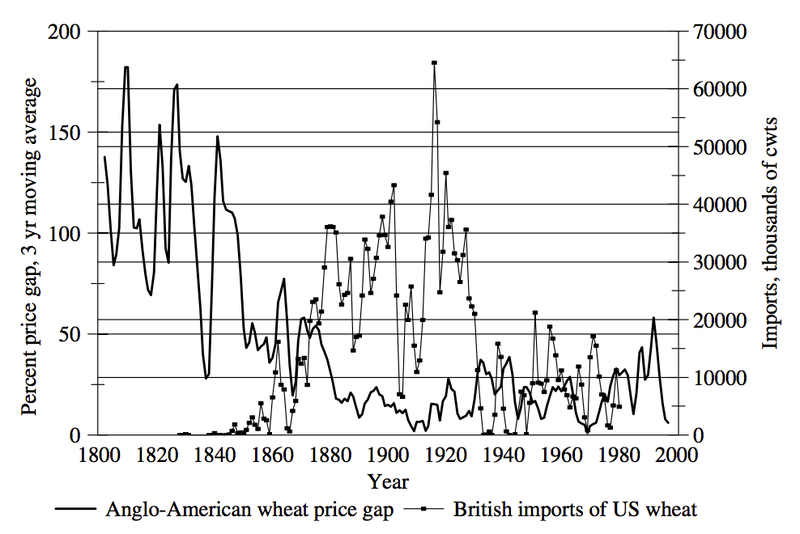 This is taken from Giovanni Federico and Karl Gunnar Persson (2007) - 'Market Integration and Convergence in the World Wheat Market' in Hatton, O'Rourke, and Taylor (ed.) (2007) - New Comparative Economic History: Essays in Honor of Jeffrey G. Williamson. MIT Press. Engel, Ernst (1857). "Die Productions- und Consumtionsverhältnisse des Königreichs Sachsen". Zeitschrift des statistischen Bureaus des Königlich Sächsischen Ministerium des Inneren. 8–9: 28–29. Available online.